Time has been ticking away at quite an alarming rate in the past few weeks. Suddenly my time here in Switzerland has come to an end and by now I should be gone (scheduled post!). It'll be sad to leave my mum, my dogs, and the mountains. I'm not sure if I'll get to bake as much as I have here either once my term starts next week. Before I head back to Oxford, I'm going down to Cornwall. It's probably my most treasured childhood holiday place if you discount Switzerland. In fact, I posted about it last year here. I thought I would celebrate going to Cornwall and make Eccles Cakes. Somehow, this turned into take two of how to combine circles of butter soaked puff pastry with lots of caramelized sugar and a scant amount of fruit. (See Pear Tart Tatin). The Eccles cakes I ate as a child were from a little cornish bakery. It was a glorious place, full of goodies and close to the place we always went on holiday when I was little. My favourites were the treacle tarts (more to come on them at some point in the near future), the tiny little buns called 'splits', the beef pasties (of course) and the Eccles cakes. 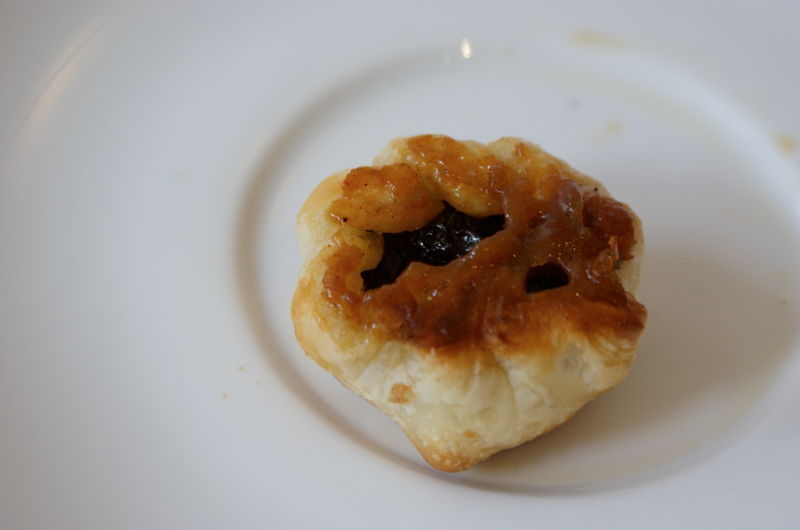 The best bit about these Eccles cakes was the caramel that used to come out from the join on the bottom of the pastry. This was the highlight. The bakery closed a few years ago. It felt like a whole section of my childhood shutting. It's still a bakery, but wholly inferior - it's lost the magic. We knew the serving ladies and I would sometimes peek into the big kitchen in the back in awe. Maybe that's where this all started! And so, when it came to making these, I knew I had to be absolutely sure that there was going to be caramel involved. It might have just come from the filling itself but I decided to take no chances and put the caramel there myself. This was a bit of an experiment. Thankfully, it worked! I made a butter-and-sugar caramel and then stirred the fruit, spices etc into it. It did clump up a bit but that was no major problem in putting them together. Then I took them out of the oven, turned them over, and voila! They're much smaller than my beloved originals, but they're awfully cute. (Oh dear, not cute food again...). I thought that all the caramel pieces would melt in the oven but it seems they were insulated - some of it melted and some remained gloriously crunchy. A very welcome surprise! I have to admit these are not wholly traditional Eccles Cakes. If you are from Eccles, Greater Manchester, please don't take offense. I may only have just discovered that's their origin (having only ever eaten them from the Cornish bakery, I presumed they were Cornish...oops). They don't seem to sell currants in Verbier so I had to settle for raisins. I did funny things with caramel, I didn't use candied peel, I used the rest of the ready-made puff pastry and so on. I'm sorry. They're very nice, I promise. I reckon three is the perfect number of these to eat - any more, and I feel sick. My mum disagrees. Weigh out the soft brown sugar, dried fruit, spices and rind together in a medium bowl and mix to combine. Put the butter (chopped into small pieces) and caster sugar in a heavy-bottomed saucepan until the butter melts and the caramel deepens in colour and thickens. Tip all of the dry ingredients into the caramel and stir quickly. Remove the the bowl. Try to separate the bigger lumps of caramel into smaller pieces when it has cooled slightly (don't worry too much, you can always chop it later). Preheat the oven to 220C/425F. Roll out the pastry to 3/4 mm thick on a floured surface. 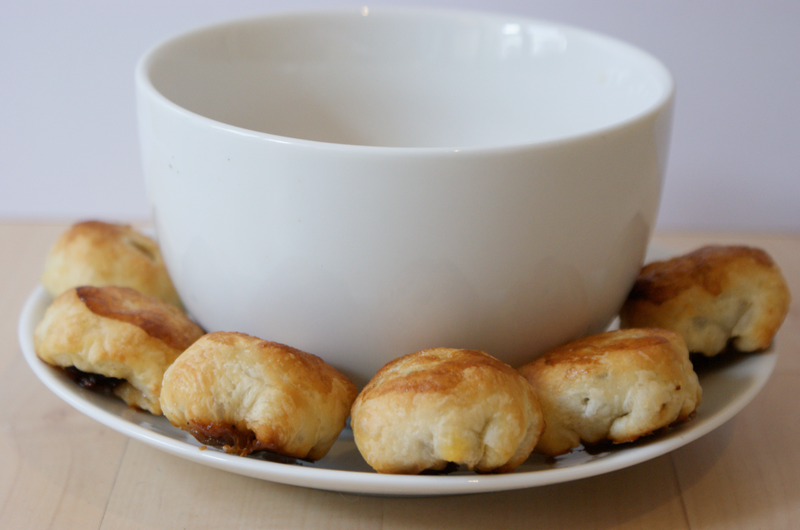 Use a small circle cookie cutter to cut rounds from the pastry. I think I got about 20 with one re-roll. Put a teaspoon-worth of the fruit mixture in the centre of the circle - I often just selected a small lump of caramel and a few raisins to make up the right amount. Using your fingers bring one side of the circle up to the middle, the work around the circle, bringing it up to the top and joining. Turn over and set aside. Repeat. 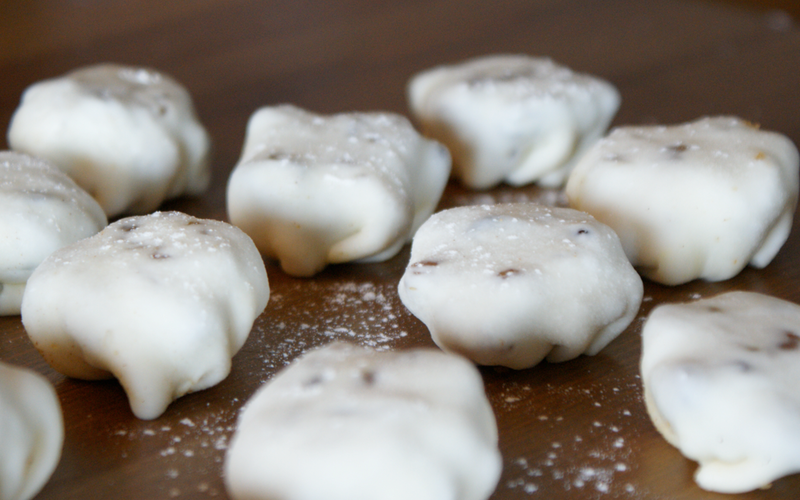 Put them onto a lined baking sheet and cut two little slits in the top. Brush each one with a little milk and sprinkle a small amount of caster sugar over the top. Put into the oven and bake until golden and crisp - about 10 minutes. Remove to a wire rack to cool. I miss the alps. Your mountain picture is beautiful. 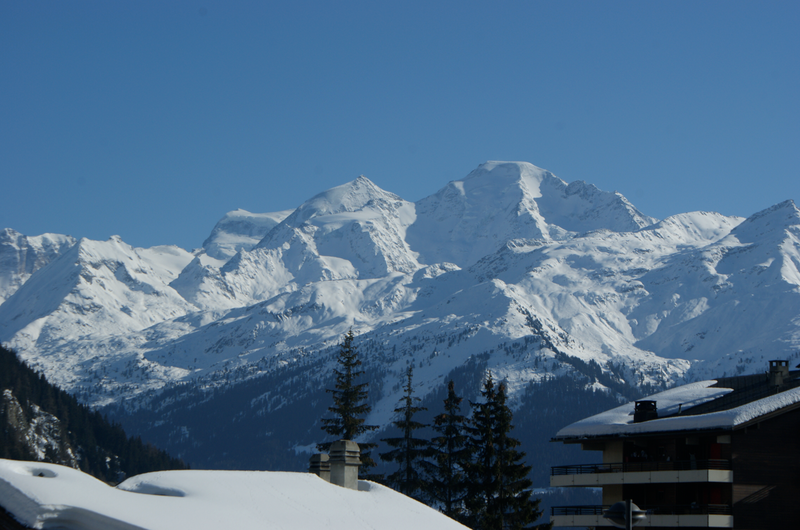 I was supposed to be in Verbier with my friends a few weeks ago for a ski trip. They rented a wonderful house and just loved it. I couldn't join them. Well, I went up to Keystone instead (Vail's little step sister). And Cornwall, my best friends son lives there. It is absolutely beautiful. You are very, very lucky. 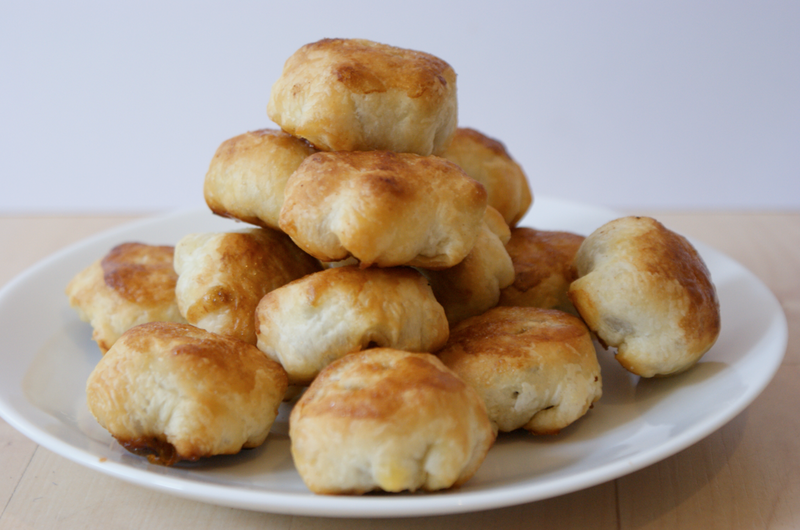 I would join your mom in definitely eating four or more eccles. No question. What a lovely idea! I love the photos with the glaze on top. 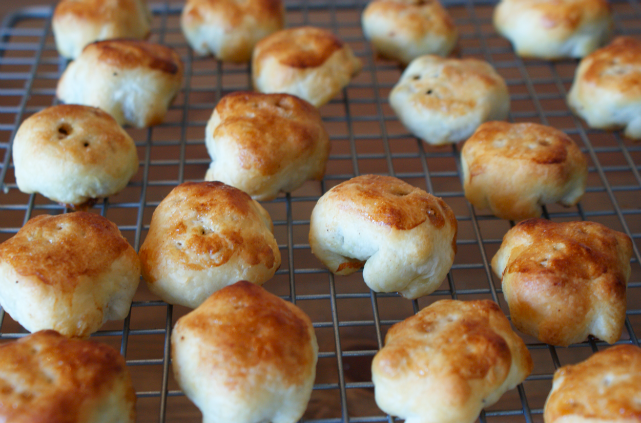 I've never heard of these; I must try this out whenever I am left with leftover scraps of homemade puff pastry. Thanks for sharing this recipe. The mountain photo is beautiful! I wish I could be Switzerland. Gosh, this is so cute. I love them. 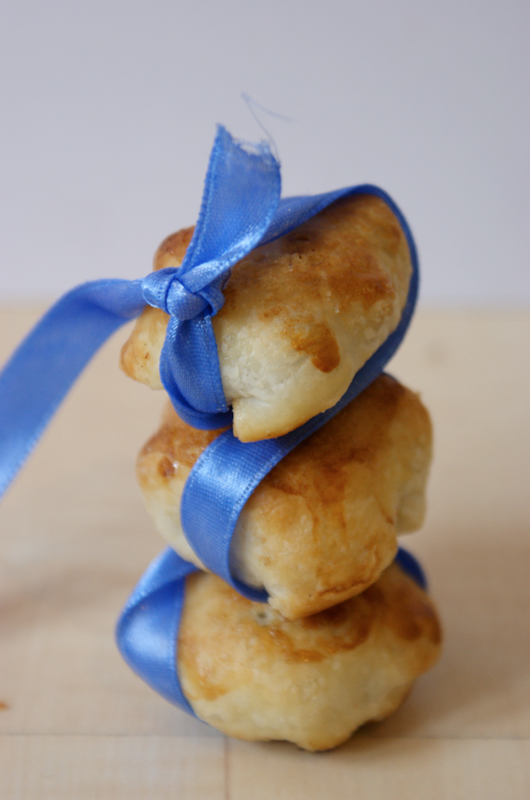 I really want to try making eccles cakes. Great blog, this is my first time here. You have a cool blog! Cute little cakes, and beautiful mountains! They look great, love the sound of the caramel. Safe travels back to the UK, if youc an get a flight that even comes this way!!!! These look so gorgeous and crisp! I'm not sure I'd be able to stop at just three. 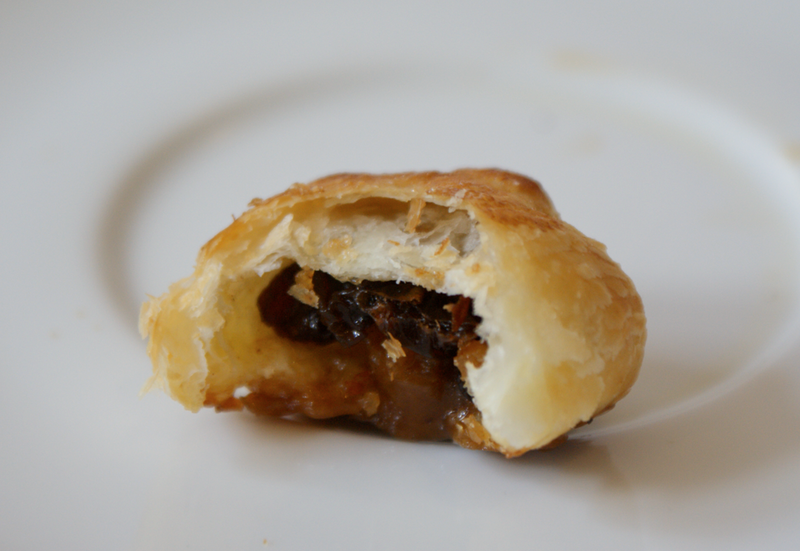 I've been meaning to make Eccles Cakes for ages now but I am so pleased I waited until reading this post! Your cakes are adorably fab and I am definitely remembering the caramel addition. Wow this posts rocks! I love the cake recipe. I am glad that I have stumbled upon this article. Worth my time,.